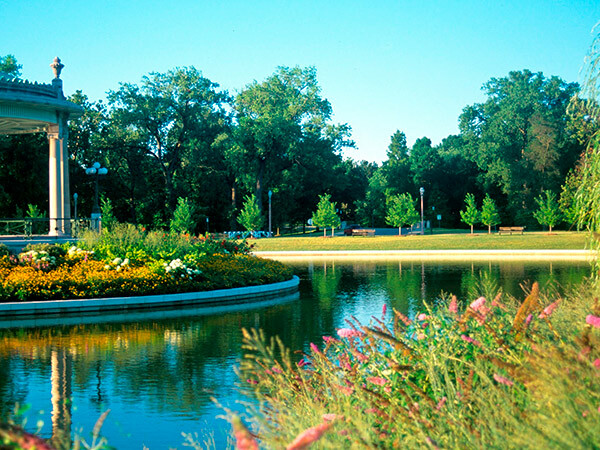 Located five miles west of downtown St. Louis, this 1,371-acre park opened in 1876. The River des Peres (River of the Fathers) that meandered through the northern and eastern sections of the park was one of its most important features. Landscape gardener Maximillian Kern transformed the river’s floodplains and lagoons into a series of interconnected lakes. Unfortunately, these transformations—exacerbated by the flow of the metropolitan sewer system into the river—resulted in a fetid swamp. When Forest Park was chosen as the site of the 1904 World’s Fair, the river was considered an unhealthy and unattractive liability and was diverted and buried. Following a flood in 1915, the City of St. Louis commenced burying the river’s eighteen-mile-long stretch, and, by the 1930s, the Works Progress Administration had accomplished the goal. 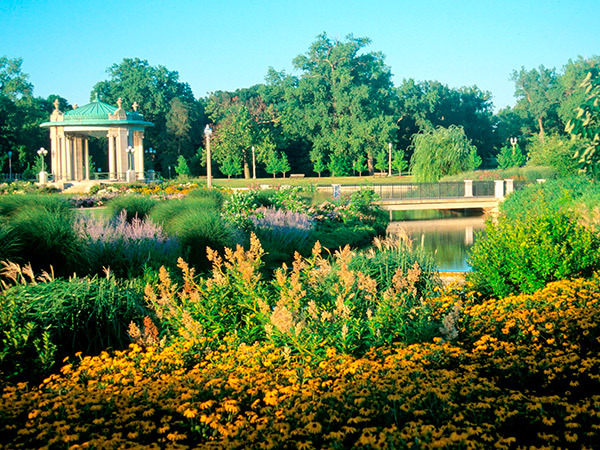 In 1993 renewed investment in Forest Park led to a master plan for its redevelopment. Because the river could not be unearthed, engineers and hydrologists worked with Oehme, van Sweden & Associates and landscape architects John Hoal, Darrel Morrison, and Austin Tao on a project to mimic the historic riparian system above ground. Originating in the park’s northwest corner, the waterway flows east, gaining momentum with inputs from Post-Dispatch Lake and the Grand Basin, and receiving recirculated water from Deer Lake and the Steinberg Rink, before emptying into Jefferson Lake. Volunteers with the Flora Conservancy of Forest Park planted nearly 28,000 perennials in just four days in 2000. Constructed wetlands, savanna, and prairies, a restored bandstand (originally built in 1876 and replaced in 1925) in Pagoda Circle, new bridges, trails and roads, and dramatic limestone riffles now enliven the once neglected River des Peres.